Modern tea service or not? Very small green letters on base. My name is Amanda and following successful treatment of cancer at the age of 44 I made some major life changes; notably I gave up keeping horses and competing in dressage for the first time in over 35 years. All good but what to do with all that spare time? Answer I took on an allotment (plenty of fresh fruit and veg, took up sewing and of course started collecting china. The china interest was sparked by a beautiful trio of Wileman Foley daisy shape in the blue bamboo pattern. I had to buy it and promptly brought a display cabinet to start housing my new collection. 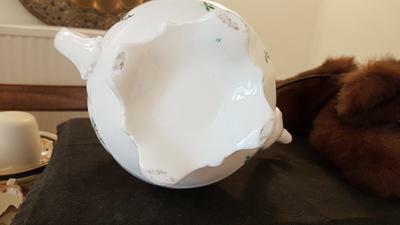 I stuck to Wileman Foley for a while and have some lovely pieces, I also added a couple of pieces of early Shelley, some of which I have brought from sellers on Facebook. One of these sellers had an auction sale and this lovely tea service was one of the items; it consists of a teapot, milk jug, lidded sugar bowl, slop bowl, six trios and two bread plates. I put a cheeky bid of £20 on it and won, I also got some gorgeous cut glass for even less. I know little about it and the seller knew even less (probably why she let it go into the auction). The greatest challenge has been not knowing where to start, it looks hand painted and has very ornate handles and finials but is pottery and not china. 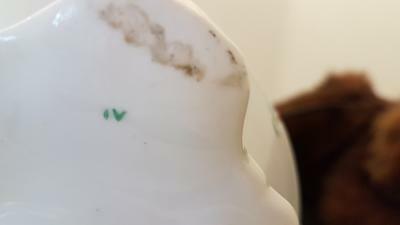 There are no makers marks on it other then the green letters or they could be Roman numerals and they are only on certain pieces; tea pot, milk jug, sugar bowl. 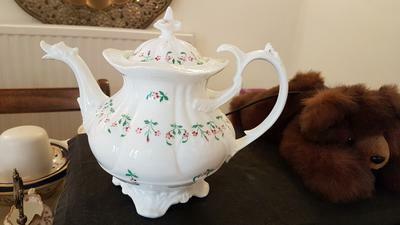 The tea pot spout looks like a dragons head, I have tried to show this in the photographs, as mentioned I believe it is pottery and therefore the casting of the finials and handles is not particularly fine. love it regardless and would not want to part with it, but I like to know some history of a piece. I have a beautiful 20th century Lubern 22k gold coffee set which has limited value but has the story behind it of Bernard and his wife forming their own company using their names to make Lubern etc etc. I am regularly searching online, in books and picking the brains of friends with similar interests. This is my first query to your site and I like the feel of it, like minded people helping each other. 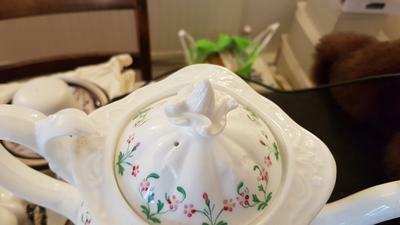 I have attached photographs of the tea pot, lidded sugar bowl, milk jug and one of the tea cups. Each item has a picture of the item, the base and a close up of the mark on each. I have looked everywhere I can think of and spoken to several people who I have brought china from who have more experience than me but no one has any idea. I don't mind if it turns out to be a 1980's production I love it, but I just have a feeling there may be more to it. I think against it is the fact it is pristine white and does not appear to ever have been used. I don't have an ebay shop or a store but I would be more than willing to help anyone with anything that I have knowledge and experience of, I am not particularly interested in values as I buy things that I like and try to buy well, but as long as I am happy with the price I paid it does not matter if it turns out I have overpaid. I would love someone on here to be able to tell me about this service and if it turns out to be another ‘Johnsons Summer Chintz’ then so be it. nb: I have been unable to load anymore photographs other than the tea pot but I have several more if required.